Marlene here from ScrappinCookie to wish you all a HAPPY HALLOWEEN! I want to start off by sending everyone affected by Hurricane Sandy in the East Coast my Thoughts and Best Wishes. I hope everyone is safe and doing well. My Family and I are doing well, we only had some really strong winds and rainfall although being only 100 miles from where Hurricane Sandy made landfall. I'm here to share with you all my LAST Halloween Shaped Card - BREWING UP SOME FUN! The Cauldron was cut from the Cricut Create A Critter2 Cartridge at 5.5". Its actually the reason why I purchased the cartridge. 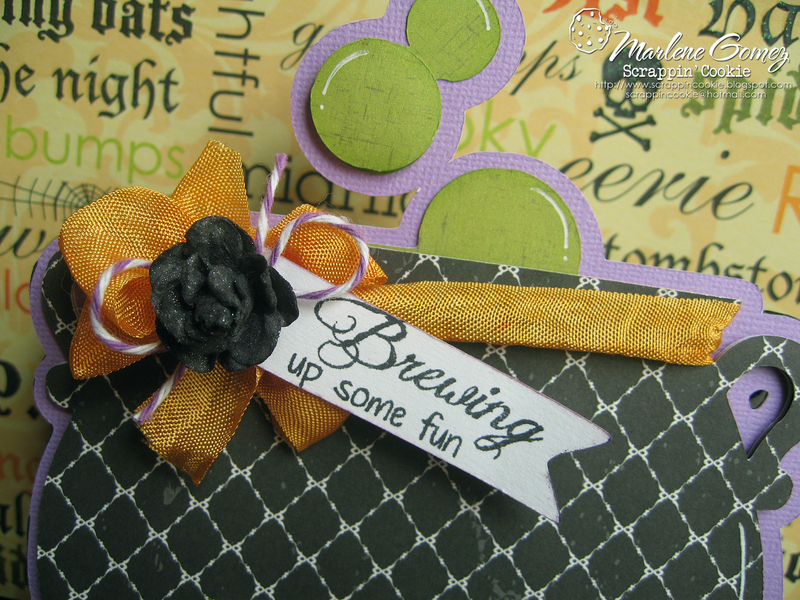 As soon as I saw the cauldron I knew it would be perfect for the "Brewing up some fun" Sentiment from the My Craft Spot "Ghostly Greetings" Stamp Set. I added some of My Craft Spot's "Candied Orange" Crinkle Ribbon around the cauldron and tied a double-loop bow. Before adding the senitment strip, I added some "Lilac" Trendy Twine - available HERE at My Craft Spot - and a mulberry rose dyed black. 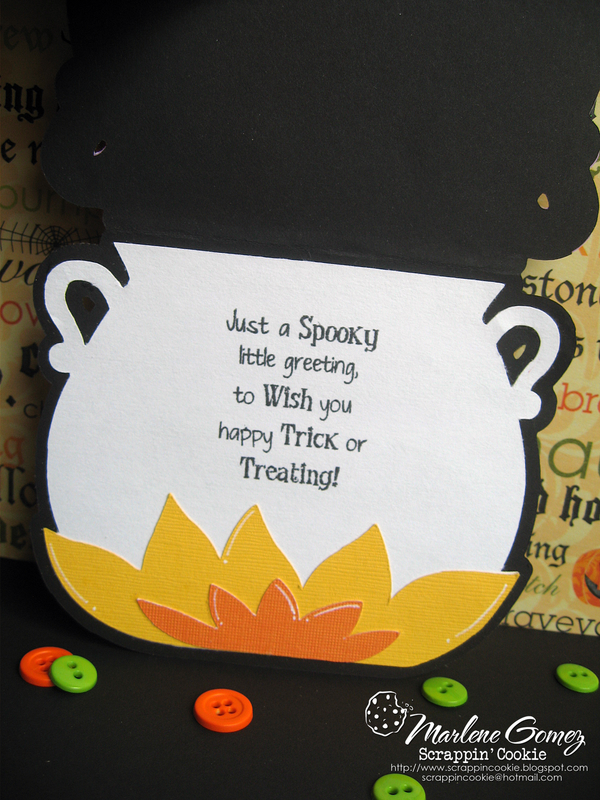 To the inside of the cauldron, I stamped the "Spooky Little Greeting..." Sentiment from the My Craft Spot "Best Witches" Stamp Set. 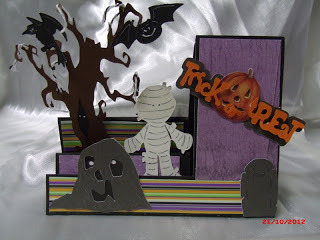 I hope you have enjoyed my last Halloween project for 2012. If you haven't already joined us for this week's TOO CUTE TO SPOOK challenge, there's still time!! You have until Monday, November 12th 11:59PM MST to enter for your chance to win this week's prize! 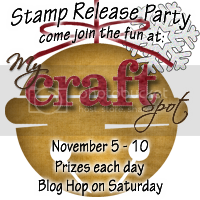 And don't forget your invited to My Craft Spot's Christmas/Winter Stamp Release Party!! We will be celebrating the newest stamp release all week starting November 5th! For more details, click HERE. For more details and pictures on my BREWING UP SOME FUN, please click HERE. Winners for Challenge #74 - Little Monsters!! 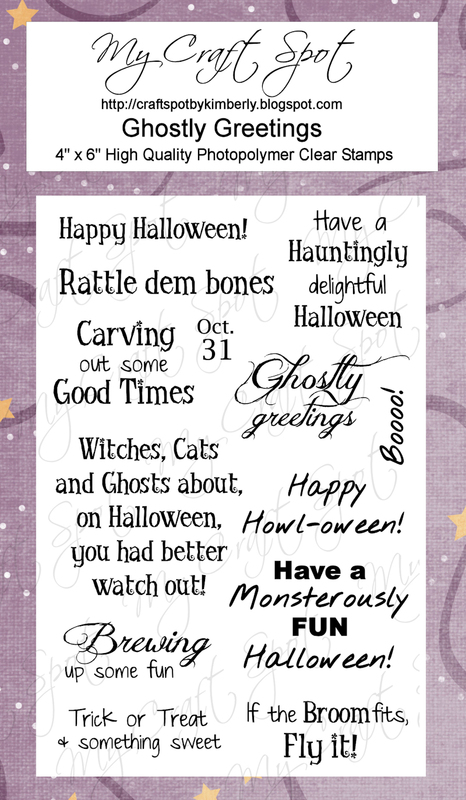 You won the Best Witches To You Stamp Set! 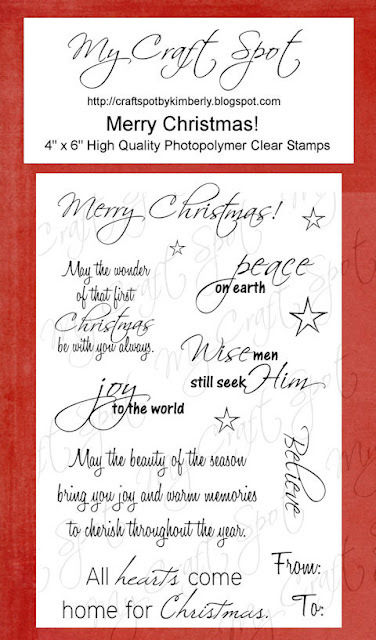 Merry Christmas & Tiny Tags back in stock! For all of you who have been waiting so patiently, the Merry Christmas stamp set and the Tiny Tags stamp set are back in stock. Yay!! All backorders shipped on Monday! DT post by Kate - Feel better soon! Hello crafters! I'm Kate from Small Bits of Paper and I'm delighted to be sharing my card with you today. 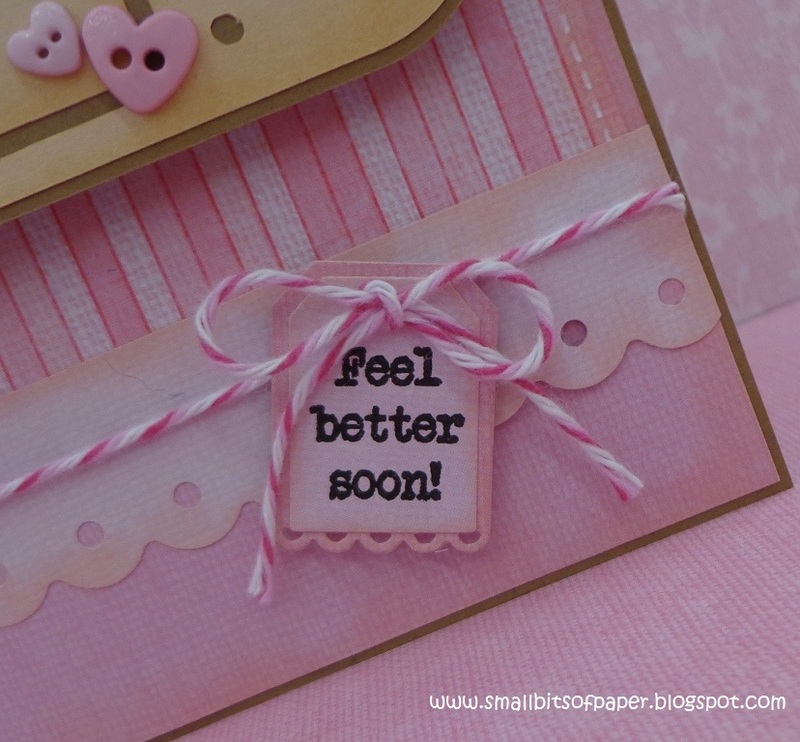 Unfortunately, a friend of mine was recently quite ill so I made this card to brighten her day. I used g.c.d. studios papers and inked everything with some Tim Holtz Tattered Rose distress ink, adding some faux stitching with a white Gelly Roll pen. 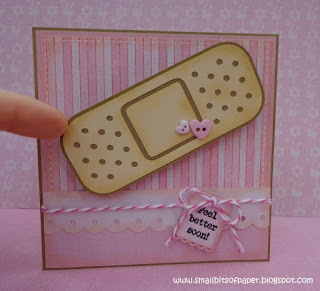 The Bandaid was cut from Indie Art and the border was cut with a Fiskars punch. 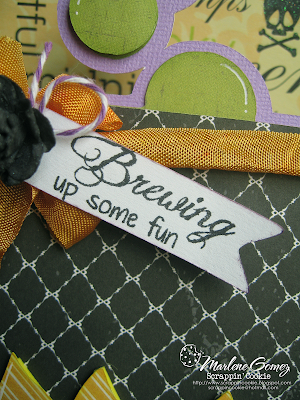 The little sentiment is from the My Craft Spot Tiny Tags stamp set and I used the My Craft Spot Tiny Tags metal dies for the tag layers. I finished things off with some Cherry Divine baker's twine from My Craft Spot and a couple of sweet little buttons from Calico Cottage Crafts. I used an Action Wobble to attach the Bandaid to the card! 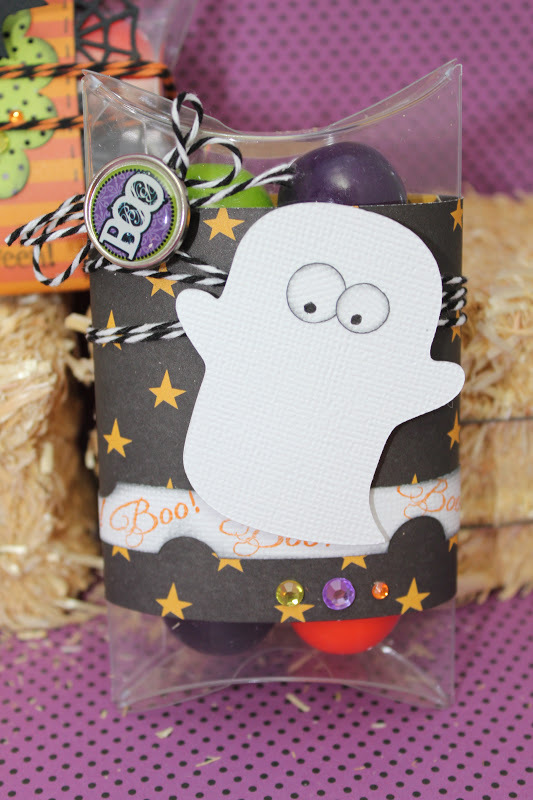 Monday Challenge #75 - Too cute to spook! It's almost Halloween! So . . . we have one more Halloween challenge for you! GiGi's card is absolutely adorable! I love the cute spider on her trick or treat bag and the faces on her pumpkin girl and cat are soooo cute! 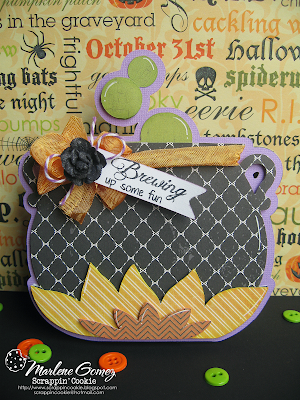 GiGi used Stampin' Around Fall and Best Witches To You stamp sets as well as Peapod Twinery Twine. I love pillow boxes and Gwen's clear pillow boxes are awesome!! 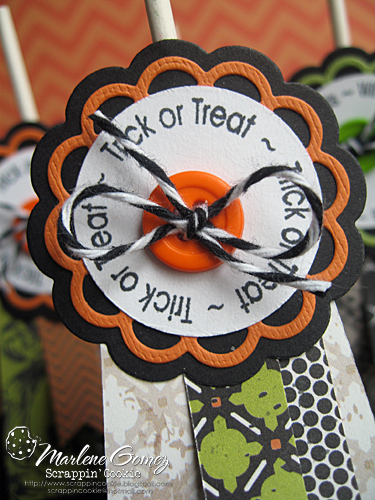 I love the spider web border - perfect with the clear box! Gwen's bat and ghost are soooo cute and the papers she used are fun! Gwen used Orange Licorice-Halloween twine, and the Ghostly Greetings and Best Witches to You stamp sets. Robin's little bear is so cute! Love the glittery hat and her beautiful dress! Robin's stitching on her crinkle ribbon is amazing! Crinkle Ribbon (Golden Harvest & Marmalade) on her fun card. Ally's treat containers are amazing! 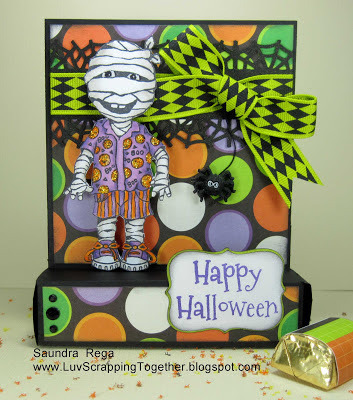 I love the spider web paper she used and the polka dot bag is so cute! Ally tied her cookie bag with black sheer ribbon and hung her spider from black jute twine. Love the eyes on her spiders! Witches To You stamp set, and Ghostly Greetings stamp set for her fun treats. Click HERE for all of the details on our upcoming stamp release party - and a chance to win a stamp set! I'm so happy to be sharing with you some Halloween Lollipop Treat Holders I've created. 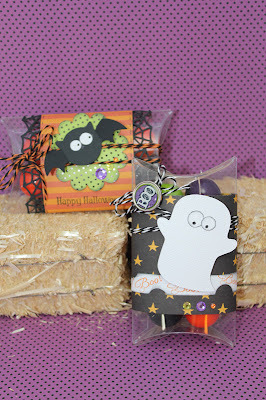 Halloween is only 4 days away, I've been trying to get an early start at Halloween Treats for my boy's classmates. 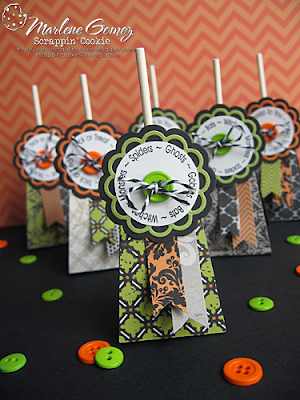 I've been seeing several Lollipop Holders in galleries and blogs and think these are a perfect Halloween Treat. I don't own any Lollipop Treat dies, so using Cricut Craft Room I designed my own Lollipop Treat Holder - available at my blog ScrappinCookie - to coordinate with the My Craft Spot "Tiny Doilies" Metal Dies. These are so easy to create since you can cut out several of the holders at a time. 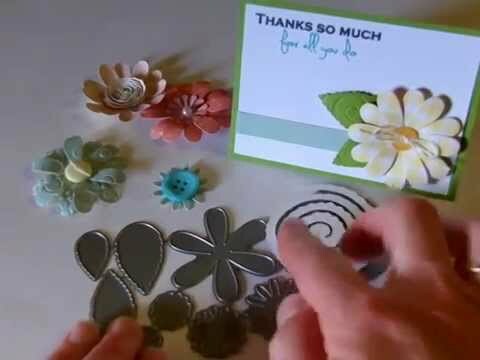 I then cut the "Scalloped Circle", "Lacey Circle" and "Large Circle" from the My Craft Spot "Tiny Doiles" Metal Dies using my Cuttlebug Machine. 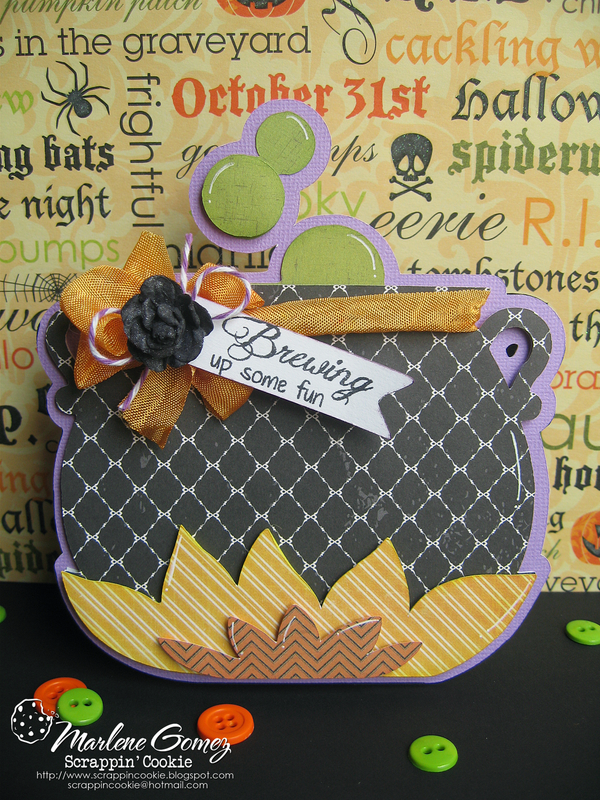 The "Large Circle" was then stamped with the Halloween Sentiments from the My Craft Spot "Stampin Around Fall" Stamp Set. The "Scalloped Circle" Topper was then adhered to the Lollipop Holder. 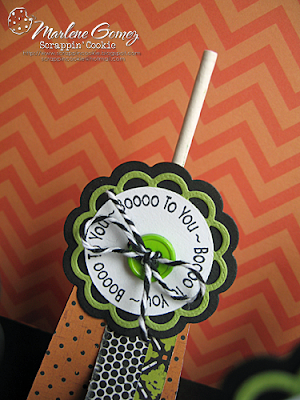 I used some "Black" Trendy Twine - available HERE at My Craft Spot - to hold a Blow-Pop Lollipop inside. To keep it all closed, I added a small button and tied a simple bow. 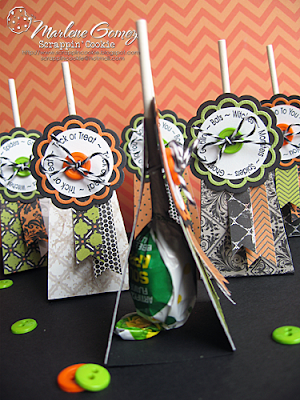 I hope you have enjoyed my quick and easy Lollipop Treat Holders. Don't forget there is still time to play along this week's LITTLE MONSTER challenge, there's still time!! You have until Monday, October 29th 11:59PM MST to enter for your chance to win this week's prize! 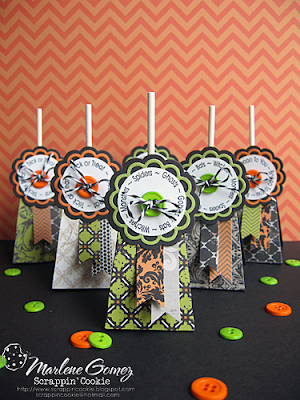 For more details and pictures on my HALLOWEEN LOLLIPOP TREAT HOLDERS, please click HERE. 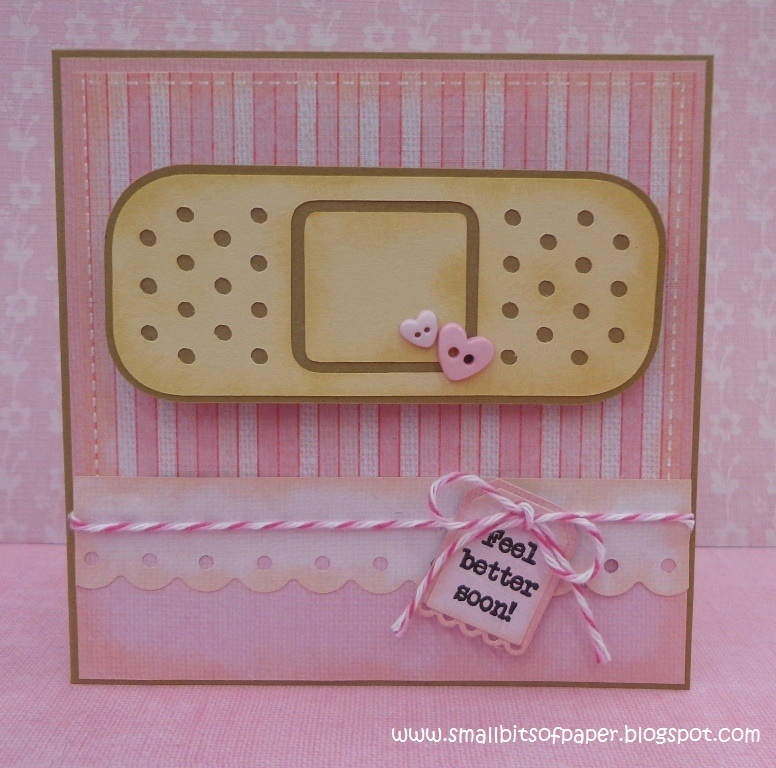 I cut 2 shadow pieces at 5.5 inches to form the card base from the Sweet Treats cartridge. Then I cut all of the fun layers and adhered them to the top of the card. 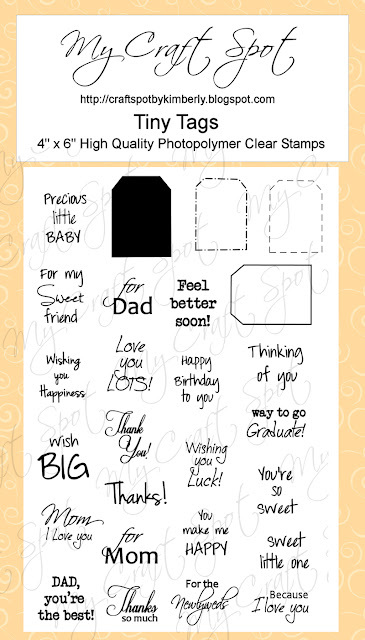 The fun sentiment is from the Birthday Wishes stamp set. I hand cut the tag, added a bit of faux stitching and attached it to the card with twine and a button. I ran a line of adhesive (pink atg gun) and then gathered the Scarlet Red crinkle ribbon, pressing it into the adhesive as I went. I can't remember what size I cut the smaller card out at. Sorry! This sentiment is from the Tiny Tags stamp set. Winners from challenge #73 - Emboss it! DT post by Marlene - Happy Haunting! 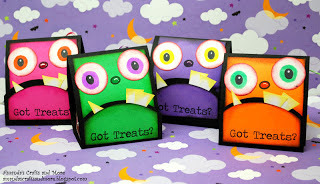 DT post by Gwen - Will spook for Treats! Monday Challenge #73 - Emboss it! Winners from Challenge #71 - Boo to you! New to My Craft Spot - Strings & Things! DT post by Marlene - Hip Hip Hooray! DT post by Ally - Sweet cupcakes for you! Winners from Challenge # 70 - Falling Leaves!